Its absolutely impossible to win in every trade. By a lot of practice and technical analysis its only possible to increase the success rate in Binary options trading. So where lies the secret of success in binary options ? The true success lies in money management and trading strategy with disciplined trading. Many people constantly fail in binary options trading. They look for Binary options Robots , auto trading softwares to get rich quickly, and further lose money. If there were some real profit making trading software or robots , why the owner of the software would like to sell it. No body in this world want to make some stranger rich for Free or by charging few bucks. Instead they would create as many accounts with different brokers and make millions from these accounts. Now , Let’s see what can actually bring you success in binary options trading. Trade small amount (1 or 2 %) in each trade, make 5 to 10 trades daily to make 5 to 10 % profit daily. Although trading binary options trading is available 24×7, its not wise to trade 24×7. Trade only when there is good volatility in the market and technical analysis gives a good predictions. The best time to trade is usually when London and New York markets open simultaneously (1200- 1600 hrs GMT), and Sydney and Tokyo (2300- 0600 GMT). Constantly follow your money management strategy. Write down your strategy and investment rules and follow them strictly. I follow Stochastic, RSI and Bollinger bands to find my trading points. When Stochastic is greater than 80, RSI greater than 70 and Candle ends out side upper Bollinger band, I go for a PUT with 5 minutes expiry. When Stochastic is less than 20, RSI less than 30 and Candle ends out side lower Bollinger band, I go for a CALL with 5 minutes expiry. This works best in a range bound market. Avoid this method when market is in a strong up trend or down trend. After a loss making trade , I wait for next opportunity and invest double amount to recover. This gives my account a steady growth. But I stop trading after 4 consecutive losses and start a fresh. For a $1000 account, I start trading with $5, and after a losing trade I trade with $10 and subsequently $25 and finally $50 . If I don’t recover here , I stop trading for some time for sure. By following this strategy, I have grown my account significantly from $1000 to $70000 in 6 months. Don’t make revenge trading after a loss and subsequently blow out your account. If you follow above steps strictly, it really difficult to blow out any account in Binary options trading. Most traders usually become greedy and trade with big amounts to get rich quickly , blow out their account and make themselves poorer instead. Hence its actually poor money management to be blamed for every unsuccessful trader. Because if you follow good technical analysis , its very rare to lose 4 consecutive trades. You can refer MT4 settings and trading guide for binary options with my recommended settings. If you trade the way described above or by any other strategy , and make 5 winning trades every day investing just 1 % of your principal ($10 in a $1000 investment). Daily return / profit : $ 35 , considering 70% return. Monthly Return : $35 * 20 = $ 700 , Considering 20 trading days in a month. Here I have ignored the loss making trades, because you have to learn to manage the loss making trades by proper money management strategy. Your principal amount of $1000 can grow really fast to $24000 in 6 months and $582000 in 12 Months by systematically compounding the investment. 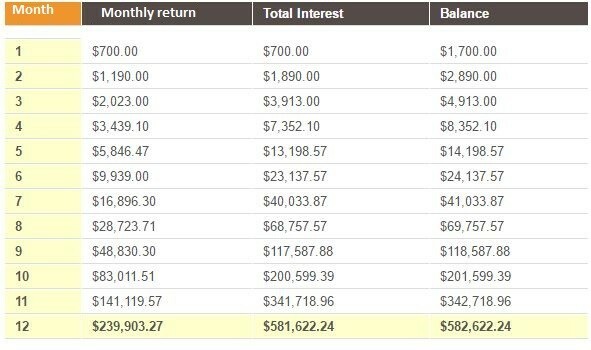 This table shows compound interest calculated for 12 months assuming 70% return every month. Hence you can see $1000 can grow to $582K , if you consistently trade with control on your emotions , strictly observing your money management strategy. Binary option trading is not like a 100 meter race rather its like a marathon, which you have to complete by setting up your small goal every day. ( just 5 wins everyday). If you lose control over your trading and your emotions over-ride your strategy, then you can never be successful in this Binary Trading Business. Final words : To be a successful binary options trader , you have to look for 4 or 5 best opportunity to trade successfully by watching market for 3 – 4 hours. You must continue this for just 1 year with proper money management strategy, controlling your emotions and greed. By end of the 12 th month, you will be definitely rich. Binary option risk management can be done by not risking more than 5% in any trade. A well proven money management strategy should be in place to recover losses. Don’t trade 15 or 20 trades a day. Trade only few good opportunities , 3 – 5 winning trades per day. Don’t trade if you lose 3- 4 trades. Don’t try to recover by increasing trade size. By doing so you may blow off your account in just few minutes. Don’t do revenge trading after a loss to recover. Rather trade responsibly to recover as per your strategy.